Today’s clue has been posted and solved, and it looks like we have a brand new artist for Rocksmith, and music games as a whole! This looks familiar… It’s a GIF! Maybe something a bit more upbeat? Last Stand of the Swiss Guard, are you learning something today? Are you excited for Power Metal band @Sabaton to come Rocksmith? What songs are you hoping to see? Or is this one metal band you could go on not knowing about. Let us know! I’m beyond excited. Love theses guys! If you haven’t seen them in concert, you should! They just love to have fun, and their music has a great beat. They are NOT Nazi lovers. Do some research before you spout garbage. All of their works are stories told about true battles/people/etc. This is a much better VDay gift than some of the other crap I could imagine them putting out. Sabaton are no Nazi sympathizers. Singing about historical facts no matter what perspective doesn’t make you agree with it. The album “The Art of War” of which Ghost Division is the opening track, is all about military tactics. It’s all about the tactics used during warfare. Ghost Division is about Erwin Rommel and the 7th Panzer Division. Rommel was a renowned strategist. During WW2 he was the one that came up with the modern Blitzkrieg tactic. This is all coming from someone of Jewish ancestry. Try to do some research before calling a band Nazi sympathizers. I dont really believe they are nazi sympathizers but fools for making a video that clearly presents Rommel’s troops as heroes when in reality they participated in genocide and atrocities against civilians. Please tell me why the video was removed on youtube i guess I wasn’t the only one who thought this type of song with the video was a bad idea. If you are a band the smart thing is dont make songs and videos that make it look like you respect the Nazi army. Also you cant separate the evils of nazi regime from the army they were all complicit and allowed everything to happen. If I had to guess the personal views of this band in secret they would tell you that Rommel was a great man and maybe Hitler was misunderstood as well. The Swedes profited from the war and feel no shame in it at all. The video that was posted here before was a fan made video, uploaded on his own channel and not at all endorsed by Sabaton. The video was not at all deleted from YouTube and can still be found here. Furthermore. On a more recent album, Heroes (2014), they have a song called No Bullets Fly. It’s about how a German Luftwaffe pilot, Franz Stigler, escorted an disabled American bomber out of the fighting zone, because he felt that shooting them down would be akin to shooting down a man in a parachute. Something his commanding officer told him was not done. In that story about a German pilot during WW2 would you say that Franz Stigler was not a hero because he was German? As for your talk about Sweden’s stance in the war. They were neutral. Companies sold iron ore to them, about 180 Swedes volunteered to fight for Germany. When the German’s decided to invade Norway they demanded use of Swedish phone lines, which they gave, they also listened in to all communications and send those to the allied forces. They trained Danish and Norwegian allied troops. Also they were a refuge for nearly all of Denmark’s 8000 Jewish population. and sheltered all Norwegian Jews who fled Norway during the occupation. Businessmen and diplomats were actively spying for the allies in Berlin and other occupied territories. But that’s all moot, because it’s in the past. It’s not the current working generations that were alive during that war, committed war crimes, dropped atomic bombs on 2 major cities, ect ect. 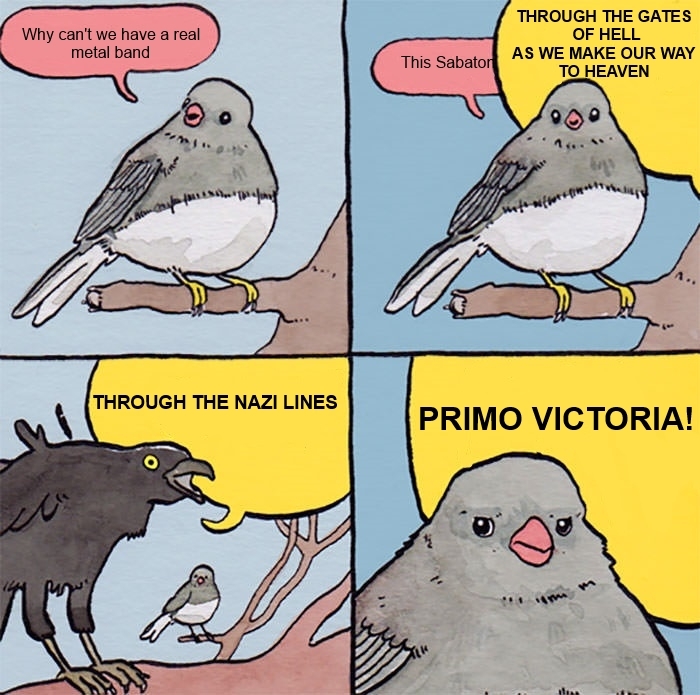 The only thing Sabaton does is tell about history, and history has a good and bad side. Both sides are deserving to be told. If you actually think and do some research before responding. It will help you a lot. Here are some sources for you. With an interesting bit for you. On their own site they have historical facts about the songs with the lyrics. Might also be a good read for you. I commend you Teinashu. You’ve kept this civil when it quite likely could have gotten well out of hand, and you’ve taught all of us a little about the band and the history they write their songs about while doing so. Sabaton is someone I never requested but glady accept in the game. Looking forward to this one. Oh and since this rocksmith, I’m guessing marleysanta knows this one, but here is the first r’n’r song. Also the first time distorted (fuzz, there is some debate, call it what you want) guitar had ever been recorded. Lotta, lotta history and stories to this song and players. But most importantly and briefly the amp fell off the top of the car (there is two versions involving the trunk) while unloading the gear. Of course was damaged, but someone insisted, bring it in and plug in. The player was upset because the cone was damaged but either Brenston or Sam philips liked it (I’ve heard/read both. Also it may or may not have had paper shoved into, sometimes attributed to why it sounds distorted) so it ended up on the recording. Obviously this gets us to our modern stonpboxes but in the interim there were people who would “carve” (I think there was another term for this as well, but please don’t do it) their speaker cone. A huge #1 hit covered many times and gave us all something we love. Willie Kizart is on guitar m, Ike Turner on piano and the tenor sax player is the father Tina’s (turner) first child. Like I said a lot of history. This is Jackie Brenston and his Delta Cats with the legendary Rocket 88. Awesome track. I appreciate, no only the shout out but also bringing refreshing my memory on this. Love to hear music history and see where things come from. We’re quickly losing a lot of those early pioneers. I know. Losing the people and talent but the history and the stories is very sad to me. I’m greatful that I got to know some of the people when I did and could. 2 in particular. 1 is why I picked up playing and the other is really sort of the unknown and vitally important member of one of the great bands of all time, which we are even lucky enough to have songs from on here. I wish we had more though. I’ve really wanted to do a documentary on him because I really miss the guy but with the death of one the most important people to making that project and the most important musician of the band as well is something of a huge loss to the story as only that musician could’ve told it. Loss is life, but some are harder than others. People should just really know my friends story. It’s one of the great tales the public isn’t really aware of. Really this is what we are putting up for Valentines….. hmmm I’m all for Metal but really????? Hmm there’s about 90 Years worth of music I want in the game and a lot of metal that would be great. Ministry, Celtic Frost, fear factory, opeth, satyricon, machinehead, sepultura/soulfly, slipknot, killing joke (yes they cover a ton of genres), I could make this a long list. And the label we have this new band coming from has released stuff I own material from, however the confirmed track we are getting is somewhere around the level of scraping the barrel. I am not impressed. I see this a a major fail and a waste of all our limited rocksmith releases this week. The metal picks usually to lean to the corny side (although the Testament/Darkthrone/MA pack was good). I’d like to see some stuff more in the Baroness/Manilla Road/Pentagram/Slough Feg/The Sword zone. You’ve got a lot of good suggestions there; I’d especially like CF, Opeth, and KJ. If they ever do a Darkthrone Pack, I’d like to hear some of the later thrashier stuff. Arctic Thunder was a ripper of an album. Anybody ever listen to Tribulation? I’d like to see them too, and they seem to have some following. Yeah thrash made for a good subgenre of metal, usually a little heavier in tone than some of the other subgenres but good head banging bounce and groove, I’m amazed refuse/resist is the only track from sepultura we’ve got. To bad they broke up when they did. Right on the verge of being the next Metallica. But put them together with fear factory that’s pretty much how you get slipknot. Metal is such a guitar centric genre (and Uber die hard fan obsessed) for the most part it’s amazing that Ubi isnt just over loaded with requests for it. Based on the song selection available it’s clearly not the case (unless they ignore it). Have you guys listened to Coroner? They are back together and have some great guitar work. Would love to see a pack from them with songs from Grin and Mental Vortex. How is this not serious? You deserve a punch in the face for that? I know things crop up here from time to time pointing out how not just bands but after years there are genres with no representation here. Just thought I’d post this since I know I’ve seen flamenco mentioned a few times. And although it would be cool if they did a good pack al a the backsmith pack that was cheap and had some fun interpretations in it. As a compromise for something that represents that but would appeal to a wider audience, I’ll post a couple videos. These guys have been around awhile their name is breed 77. I used to slip them in on my radio show occasionally and would always get people asking about them. They are a flamenco metal band from Gibraltar. So they have songs in English and Spanish. Did well in the charts in other country’s but I think they just got ignored here in the states. Doesn’t help that they never really played here. Just a couple event/festivals If I’m not mistaken. Something different is all. Arrg spell check. Fought with it a few times and thought it had given up but it found a better way to mess with me. Obviously I meant Bachsmith. Here’s another untouched one, from the islands. Something laid back. Minus her signature Gibson SG, here’s a little Sister Rosetta Tharpe to open your mind. Oh I know that sister. I’d be fine with her appearing in the game but, and you know I want more blues (like 1,000 tracks worth, so I know it’s not happening) but I’ll see your sister and raise you a mama. A big Mama. Thornton that is. Ps Elvis didn’t write that song for those who don’t know. Ah, Oni you dirty dawg. Well played sir. I love this song. (actually haven’t heard her do this with harmonica) I’m use to the version from the compilation Time-Life Treasury of the Blues. Ironically I originally thought of posting that track (Chester Burnett’s version is great to, That’s Holwin’ Wolf folks if you didn’t know) but to be able to play with the whole sister/mother thing was to tempting. There’s a lot of good stuff that one day we may just get. I’ll kick myself later but my top 3 jazz picks would be Django Reinhardt, largely considered the greatest jazz guitarist of all time. Hell of a life story and an amazing musician. However might be best thought by people here because their would have never been Black Sabbath without him. Django’s story is why Iommi didn’t give up guitar after the accident. Charlie Christian and the biggest longshot here Charles Mingus. Btw since you mentioned Fred, I’m momentarily jumping back to blues to mention I’d love some John Hammond up in here. And although there are things funk influenced coming to mind at the moment it certainly would be nice to have some Larry Graham in the selection but for the middle ground what we really don’t have enough for me is more of anything with James Jamerson. If not the best bass player of all time, by far and indisputably the most influential bass player ever (never said he had to be your favorite). Good call on Jamerson. Also wondering how we have nothing highlighting Larry Graham. I often wonder if Ubisoft might put together a package deal the way we got the Rolling Stones and Chuck Berry so close together. Prince often cites Larry Graham as a major influence. There are even some videos on YouTube of them playing together. To focus specifically on Larry, here’s a video of him playing the bass like as if it were a “lead” yes, “lead” percussion instrument. Yeah, it’s about time for this as well. Oh goody my spell check rewrote a whole section and turned it jibberish. I really hate that.